In response to this inherent problem in non-AEM instruments, other medical device manufacturers have made attempts to reduce the risk of stray energy burns from monopolar energy. The intent of these technologies, to reduce preventable patient burns, is an excellent goal. 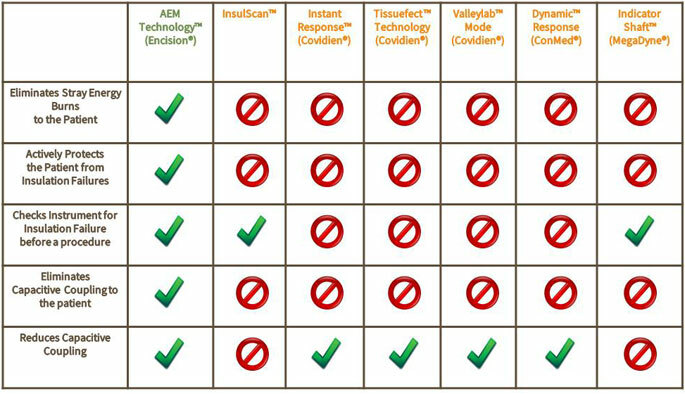 Unfortunately all of these other technologies fall short and only minimally reduce the risk to the patient. Only Encision’s AEM® technology eliminates stray energy burns from monopolar electrosurgical energy in laparoscopy, we guarantee it! Other electrosurgical energy forms have gained popularity in recent years. In specific instances these are a great alternative to monopolar energy. However, these technologies have limited application and significantly higher cost of instrumentation. Encision’s AEM monopolar instruments offer a safe, effective, economical solution.